Our online boutique designers are a curated list of folk you would not find listed in other online stores - we strive to bring new and fresh designs from them to you every week! We want to be the go-to online boutique clothing for women for all your fashion wants and needs. Be it trendy dresses, classic gowns or even formal shirts, you can customize anything you like from our online boutique collection. We even have a whole range of Indian wear including salwar kameezs, anarkalis, all the way to dressy kurtas –perfect for all your occasion wear and wedding needs, customized just like a boutique would. Many of our online boutique designers have designed indo-western dresses and even everyday wear for you to be able to customize. Our unique designs are what keeps our customers coming back for more! P.S. We’re now bringing the boutique to you! For the women of Mumbai, we offer doorstep measurement sessions with stylists so you don’t have to step out of your house looking for well fitted, unique clothes - they come to you! So go on, indulge in the bespoke designer experience, without it being too heavy on your pocket. If you’re looking for some unique boutique designers and standout designer dresses, look no more. 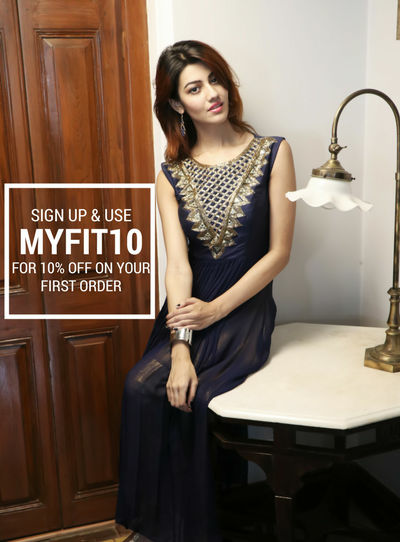 StitchMyFit brings online boutique shopping to you. With the same elements you’d find at a designer shop, now just more convenient! It’s super simple – choose from over the 1000 designs we have from our online boutiques, customize them as per your liking (you heard right - sleeves, colours, neckline and more) and upload your measurements! A bespoke, beautifully hand crafted designer dress will be delivered to your doorstep! Best of all, it’s made only for you – so you would hold a one-of-a-kind piece that nobody else would possess. Our online boutique designers are a curated list of folk you would not find listed in other online stores - we strive to bring new and fresh designs from them to you every week! We want to be the go-to online clothing boutique for women whether you’re looking for a lehenga for your cousin’s wedding or a blouse to match your new sari! Psst… for the women of Mumbai, we’re now bringing the boutique to you! We offer doorstep measurement sessions with stylists so you don’t have to step out of your house looking for well fitted, unique clothes, they come to you! Book your home styling session today!